In Québec, more than half (52%) of secondary school students had not eaten junk food for lunch during the week preceding the study, while a little less than half (48%) had eaten junk food for lunch one or more times. Close to 40% of students in Québec public secondary schools have access to at least two fast-food restaurants within 750 metres. Consumption of junk food two or more times per week is associated with obesity and other negative health measures among young people. The proportions of young people consuming junk food two or more times per week are significantly higher in schools with two (27%) or three (26%) fast-food restaurants within a 750-metre radius than in those with only one (19%) or none (19%). 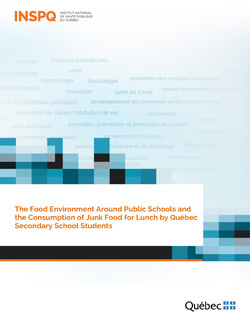 Other factors also influence the consumption of junk food among Québec students attending public schools: being a boy, being in a family with shared custody, having parents with no more than or no secondary school diploma or being in a school in a very disadvantaged neighbourhood or in an urban setting. Independently of these factors, the presence of fast-food restaurants around schools significantly increases the proportion of students who consume junk food for lunch. Our analysis indicates that the risk of consuming junk food at lunchtime is 50% higher for students with access to two or more fast-food restaurants within a 750-metre zone around the school.